Access Control Technology has released their latest access control software application, ACTpro Enterprise, for use with the ACTpro range of door controllers and card readers. Enterprise is a role based platform designed and built to meet the requirements of increasingly complex access control solutions where regular traffic places heavy demands on software. Axxium Ltd will use this year's Locksmiths' Exhibition to launch a number of innovative new products which are capable of operation by remote control. They are suitable for high security applications for use in smart homes and also in assisted living applications. Carlisle Support Services has announced that it will be sponsoring Crimestoppers, the independent crime-fighting charity. The initial sponsorship deal will be for 12 months with an option to extend this by a further two years. 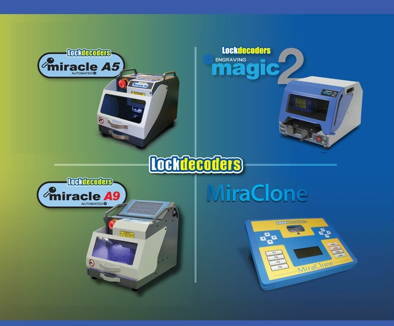 Showcasing its most recent and innovative product offerings, Mul-T-Lock will again be exhibiting at this year's Locksmith Expo. Advanced Keys are offering free postage on UK orders over £100 (excluding VAT) for the rest of February. Installing a CCTV system onto a home or property is becoming more and more prevalent and a popular way to protect homes against intruders. From comprehensive systems which connect to an interior television for complete surveillance, to the high-tech cameras which have infrared capabilities and a huge amount of memory storage, there are options for almost every property owner. SSAIB, the UK's leading certification body for security organisations. has unveiled a range of new initiatives for the coming year. These include further enhancements to its new website, an easier online application system, and an electronic auditing package. I think we all know that something big is going on this coming weekend? Yes, the annual Locksmiths' Exhibition opens its doors on Saturday! We're expecting in excess of 1400 visitors - hope to see you there! ANNOUNCEMENT THURS 28TH FEB: Just before the show kicks off we have pre registered visitor No 1250 Steve Calow - Steve if you find me when you arrive I will treat you to lunch. Mick. One other thing. We've had a notification from the police re an increase in heating oil theft during the present cold weather. Their advice to homeowners is below, but it strikes us that rural based or mobile locksmiths could turn this into a sales opportunity for additional security. Don't wait for them to come to you after they have had their oil stolen, perhaps on your travels or via a leaflet campaign to isolated properties you could point out the risks and get them to come to you beforehand? Maybe even contact your local heating oil supplier and get a list of addresses from them where they deliver, or they might even hand out your leaflets for you when they deliver the oil? Brand it as a service from you both and you could all be winners! It's not too late to register - just go to the show website, follow the link at www.lockexpo.co.uk and then register. Once registered log in, go to - my details - and then download or print your QR code. For colleagues or family you need to separately register them. There are some new faces and some reshuffling of national executive positions at the Locksmiths Guild of Australia Inc.
Ron Thomas is the new National President. Long standing President Kel Phillips has stood down in order to spend more time with his young family. Ron, a NSW locksmith, moves into the President's role after spending some years as National Vice President. Yale will be showcasing a series of exciting new marketing campaigns alongside an array of mechanical and digital security products at 2013's Locksmiths' Exhibition. Following the success of Yale's first TV campaign, visitors to stand A2 can discover more about the range of security solutions from Yale, including digital door locks, TS007 cylinders and handles and the range of Doormaster replacement multipoint locks. Home owners filling up tanks with heating oil after the recent freezing temperatures have been warned to ensure they follow crime prevention advice. As well as homes, thieves have in the past targeted churches, community buildings and business premises. Yale has launched a new range of digital door viewers, providing locksmiths with an innovative new method of preventing distraction burglary. According to the Home Office, around 11,500 homes a year fall victim to 'bogus callers' entering their homes under false pretences. In the majority of cases, intruders pose as officials in order to gain access to homes with the intention of stealing cash and other belongings, such as car keys. State-of-the-art implementation of IP video surveillance technologies reduces crime. Milestone Systems open platform IP video management software (VMS) has been installed with Samsung network cameras in a surveillance system that has brought peace and confidence to the citizens of a neighborhood in Eastern France affected by criminal disturbances. Mulhouse Habitat is a social housing complex in the Les Coteaux quarter of Mulhouse, France, with high-rise buildings, common around the outskirts of big cities. Most of the inhabitants had long been victims of intentional violence and degradation committed by a minority. They wanted a better environment with peace and security. First locksmiths and now firemen are unwilling to evict people from their homes in Spain. President of the Locksmiths Union, David Ormaechea, said that following several suicides, some locksmiths are no longer willing to carry out banks' orders to evict people from their homes. "Families' lives were being ruined, and we were acting as executioners." He added. Meridian Surveillance Systems are securing the Royal Sussex County Hospital in Brighton with door controllers, proximity readers and management software from Access Control Technology (ACT) as part of an IP-addressable system. The Royal Sussex County Hospital provides general, specialist and tertiary services as part of Brighton and Sussex University Hospitals (BSUH) which is an acute teaching hospital working across two sites in Brighton and Haywards Heath. The Trust treats three quarter of a million patients a year and is a major trauma centre for the south east of England. Leading control room furniture manufacturer Winsted Europe & Middle East has unveiled its brand new EnVision Command Console, designed and constructed specifically for today's control room technology. EnVision's introduction is Winsted's first product news for 2013, a year in which the company celebrates its 50th anniversary. EnVision's radical new modular design blends form and function in an ergonomically optimised single, double or triple tier configuration. Whatever the format, operator sight lines and viewing angles are maximised, while staff remain comfortable and productive. Each EnVision tier supports a 71/2" high slat-track section that allows for flexible equipment mounting, along with convenient accessories to help keep operators organised and reduce clutter. An iPad mini. Then get to the Locksmiths Exhibition 2nd March at Nottingham and look out for the Pinguard table stand. They will be there Saturday only. Pinguard are late entries but they have an amazing range of shields for just about any code keypad. UAP TradeLocks always pull out all the stops at The Locksmiths Exhibition to make sure they exceed their visitor's expectations and leave them talking about new things to come, and this year is no different. Following the announcement last week that UBM Live's Protection & Management Series will be moving to ExCel London from June 2014, UBM Live today revealed the overwhelming support received from the industry following the news. The SIA Approved Contractor scheme requires applicant companies to complete a stringent auditing process (both internal and external) which allows the SIA to measure compliance against the relevant British Standards. The audit process is quite intensive and makes stringent demands on applicants who must demonstrate exceptional rigour when implementing procedural and operational guidelines in security disciplines relevant to those particular British Standards. The relevant vetting documentation for security screening is BS: 7858 while site and mobile patrolling is covered by BS: 7499. UBM Live has announced that the UK-based Protection & Management Series – including IFSEC International, FIREX International, Safety & Health Expo and Facilities Show – will move from Birmingham’s NEC to ExCeL London in June 2014. Lots to tell you about this week: Visitor registration No 750 was Graham Piggot - so Graham nip along to the Payatrader stand and get your free drink voucher. Will you be registration number 1000? If you haven't yet regsistered DO IT NOW! Payatrader would be pleased to offer visitors to the show / readers of LASM the opportunity to join Payatrader and to have the joining fee refunded.